Last three pix I requested from the NYPL were of different scenes of the "Triumph Of Man" exhibit in Travelers. These were the only individual scenes they had photos of. Well, now that I look at it, it's the same buildings as your Scene 6, but the "people" seem to be arranged differently. 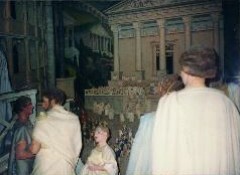 Was there another Roman scene, or did they perhaps rearrange the models between seasons? No, there was just one Rome scene. And I think the images do match because the Viewmaster one is a straight on-shot while the NYPL is angled from the left. The model that's second from the left in the Viewmaster matches perfectly to the bearded one in the NYPL one who seems to be looking at the camera. I'm talking about the people in front of the Roman columned building, on the steps. Arranged differently. The Viewmaster caption says the building is the Roman Forum. Yeah, I see what you mean now. In the NYPL shot there are no "people" on the left side of the Forum as opposed to the Viewmaster. Apparently Travelers also put out a series of glass ashtrays, each of which showed one of the Scenes. I have photos of the ashtrays for Scene 6 The Grandeur of Rome and Scene 11 The Taming of a Continent. (and I MIGHT have one or both of those in my landfill collection). I think the artwork on the ashtrays is the same as found in the booklet that accompanied the red record. Well, now that I look at it, the Scene 6 ashtray IS the same as the booklet, except it's a mirror image- everything is reversed! If good large-size photos ever surface for all 13 scenes (regardless of being color or B/W) then it would be possible to do the best kind of exhibit recreation by synching the Red Record narration to a slide show on one's computer. Bradd Schiffman had some photos of numerous scenes from Triumph's post-Fair life at Columbus posted in the nywf64.com Travelers feature. In that one you can see the Rome scene from the right side angle. Part of my getting back into the swing of things here at PTU is going back to threads where I attached a number of a photos and documents from my previous research projects. Unfortunately all these attachments were lost when the board was overhauled, so now I've taken the files and begun uploading them to a photobucket server so that way I can go back and re-edit the old messages and allow the material to be preserved permanently for the benefit of those who want to go back and revisit some old threads. These three photos of the Triumph Of Man exhibit I got at the NYPL are the first of these revisions. I recently got an original Traveler's color photo tour in filmstrip form (photos of all 13 World's Fair scenes in color), with accompanying red record, which I presume will include the "beep" signals to tell school teachers when to advance to the next frame. The filmstrip itself is dated- spring '65. And I found some documentation from the Fair Corporation that said Travelers intended to produce a filmstrip- undoubtedly it's the one I now have. I've finished scanning and restoring the photos, and put it in a big pdf file with automated frame advances every five seconds. But it's "silent". I showed it to a couple of PTUers. The next step is to see if I can capture the audio off that red record (which I don't really know whether it's a special classroom version or just the standard red record), and try to get the audio into the pdf and synch up automated frame advances to the beeps (assuming there are beeps). That is, when I have time....had hopes of working with my son on the audio capture over the Christmas holidays,...but alas it wasn't meant to be. Sounds like a great project! I know all of us will eagerly await the results. Is there just one introductary picture before the first exhibit one, showing the pavilion, and are there any images beyond the final exhibit scene? That would offer some hints as to whether the narrative program was any different since the Red Record script only has the one introductary segment and nothing following the last exhibit sequence. ...here is the "silent movie". To download it, it's 34 megabytes, so be patient. It pretty much follows the same sequence depicted in the pamphlet that accompanies the standard red record, but then it continues with a general tour of the World's Fair. It should open up automatically and run itself, advancing a frame every five seconds. I think it was five seconds that I specified.....it might not advance automatically unless you save it to your hard drive and run it from there. Anyway, even if you look at it in your web browser, you can always advance frame-by-frame at your own preferred speed by pressing the page down button on your keyboard. Clicking your mouse also advances the frame. NOTE: I scanned these on my old flatbed scanner, and because it was a filmstrip I had a lot of trouble holding down the film flat against the glass, so some of them came out with focus problems. They were all also almost totally faded to red- so I had to run it through a couple of software restoration packages. But I got a hot new film scanner for Christmas, so I'm planning on rescanning these....the film holder templates that came with the new scanner will hopefully allow the film to be "shot" while perfectly flat, and the scanner has a manual focus control, which my old one did not. ....When time allows. For now, you can look at it here and get an 'early look' at what classroom students got to see back in '65, '66 and probably for several years after that. If a frame or two are a little out of focus, just pretend you are Howie in the back row in the 5th grade, who wore those coke bottle glasses. As Eric says, the ultimate goal is to turn this in to a fully automated digital multimedia presentation, with all the photos fully restored and cleaned up, and with embedded audio track. Even unrestored it looks great! I can probably get a chance later to just play the audio of the Red Record from the computer file and synch it up to viewing of this to get a taste of the final effect that I know you'll eventually bring to us. Congrats on locating and bringing back this filmstrip (I can still remember those too in my early grade school days). Even on my old scanner without any focus controls, guess which frame on the filmstrip came out the clearest? You guessed it- the Focus frame. Ha! Randy, that was just amazing! I have a red record on its way, so I'm going to see if it has the beep. If it does...whoopie! At any rate, maybe Powerpoint would be the way to go for synching the pictures with the record. You could transfer the record either onto a CD or rip it into mp3 format. Some notes about the World's Fair tour pictures. From the first frame we know that this was produced in May '65 (and that checks with the Fair Corporation's "new in '65" press release that said Traveler's was going to produce a filmstrip for use in classrooms and presentations across the country (like to Rotary Clubs, Moose Lodges and the like). And some of the pictures- like the Churchill Center- we know were new in 1965, so those pictures were 'hot off the press'. But there are others - such as Greyhound Escorters, the Continental Circus, and the Tower of the Four Winds paint job, that we know are from 1964. So I guess they grabbed whatever pictures were handy. One of the last ones shows the fireworks show at the Fountain of the Planets, and there are some additional fountains on the right. In case you didn't recognize them- those were the fountains around the base of the Traveler's Pavilion.